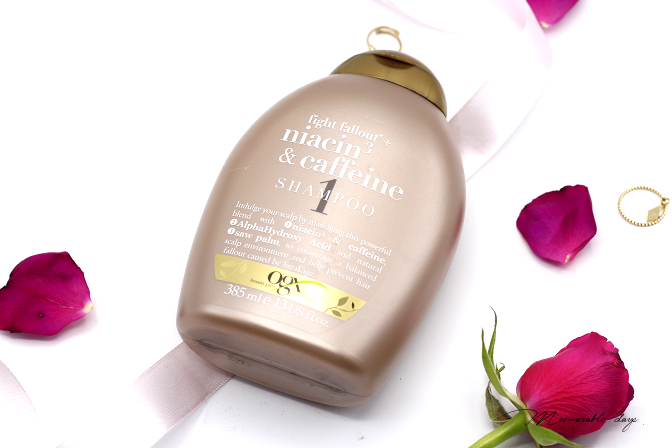 Review: OGX Niacin & Caffeine Shampoo | Memorable Days : Beauty Blog - Korean Beauty, European, American Product Reviews. OGX is famous because of their hair products. I have been using their argan oil for my hair for a long time and absolutely love it. 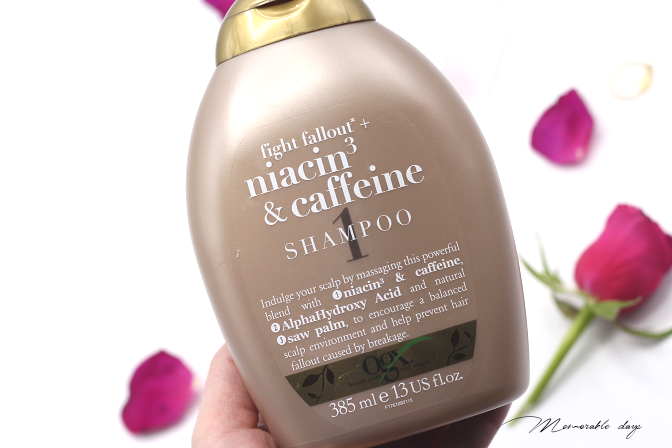 I recently received a shampoo of their Niacin & Caffeine line for review purposes and I will share my short review about it in today's blogpost. 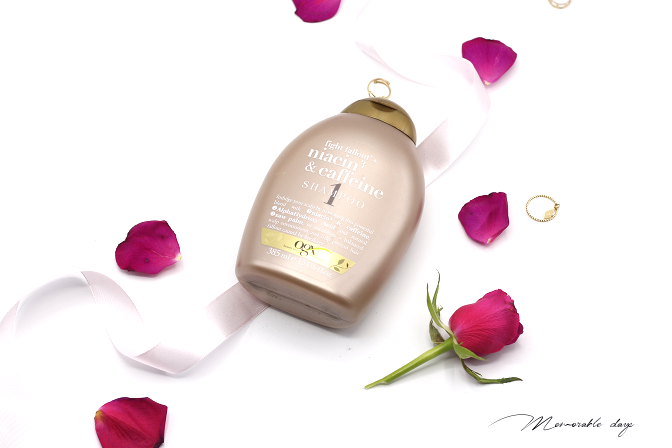 It is a fusion of niacin and caffeine, this shampoo and any other product of this line can help exfoliate and stimulate your scalp while combatting hair loss and it even stimulates blood circulation there. Sounds good right? Who doesn't hate hair loss? You can fight fall out now with this line! For best results, OGX recommends to use each product in this collection together. I only got the shampoo, so I will only be reviewing it today. This line also contains a conditioner as well as a root stimulator spray. They are against animal testing, these products are paraben and SLS free and you can also use this when you got dyed hair. All 3 products in this line is €10,99 each. In The Netherlands, you can get them at the local drugstore like Kruidvat, Trekpleister and DA. In the UK you can find these at Boots. It doesn't have a strong scent, but it did take me a while to get used to it (i got a sensitive nose). It feels cooling on the scalp and it keeps my scalp clean. I am surprised that it really helps with preventing fall out. That doesn't mean it won't fall at all, it does, but less than normal. I can even use this on my dyed hair without any problems. I do wish it foamed more while washing my hair, but that's a personal preference. This post caught my eyes because I have been looking for a good shampoo and conditioner for my dry damaged hair that falls out pretty easily. You mentioned you had to get used to the smell- I have a sensitive sense of smell too, so i wonder, what was the scent like?